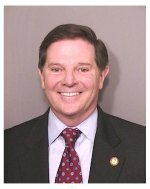 A couple of times in the past day or two I’ve caught a snippet of a news story talking about someone being charged with a crime and disputing the authority of those charging him, and each time for a split second I think it’s a story about Tom DeLay. Of course, it’s always really about Saddam Hussein. Easy mistake to make. How can it be acceptable for a politician charged with a crime to be running ads to smear the prosecutor? But then what Ronnie Earle is experiencing is nothing compared to what will be coming down on Patrick Fitzgerald if he has the audacity to indict anyone in the White House for outing Valerie Plame or impeding his investigation. Look, it can be a great advantage to have people in your party who push the boundaries and dance close to the line of illegal behavior. But if you want to reap the benefits from that, you also suffer the consequences when the dancers aren’t quite as skilled as they think they are and a misstep sends them into illegal territory. The current Republican leadership apparently wants the United States to be the sort of country where the laws apply to everyone except members of the ruling party. Fortunately, I don’t think they’ve managed to degrade us quite that far yet, but we’ll see. I’m not going to speculate on who is going to be indicted by Fitzgerald, or what the charges will be. Instead, I plan to use the time more productively: browsing for popcorn recipes. Between the forthcoming indictiments and the prospect of seeing Delay’s mug shot after he gets booked this weekend, I want to make sure I have the right snack foods on hand. It’s been amusing the past two days to watch the shrieking meltdown occurring on the right over the nomination of Harriet Miers to the Supreme Court. We’re seeing harsh criticism of Bush from people who have previously blindly supported his every action and statement (and painted people who didn’t as traitors). I still imagine that they’ll soon be putting this unfortunate episode behind them and returning to their faith in Our Leader, but for the time being I think the best strategy for the left is to sit back and pass the popcorn, and certainly not to make the conservatives more comfortable by criticizing Miers too strongly ourselves right now. It’s been particularly funny to see the outcry on confirmthem.com. The site’s whole reason for being is to support the idea that all of Bush’s appointees must be rubber-stamped by the Senate, so it’s hard to see how they can justify the sort of posts that appeared starting on Monday. Perhaps they just need to change their domain name — Orin Kerr on the Volokh Conspiracy has a few suggestions. There is no event that cannot be related to an episode of “The Simpsons.” The freak-out among social conservatives about the Miers nomination reminds me of the “Kamp Krusty” episode, truly one of the all-time greats. You’ll recall that Bart and Lisa spend a summer at Kamp Krusty, which is gruesome, ghastly and horrible in about a million different ways. If this analogy holds true, Cheney and Rove will soon be heard to say, “To the hydrofoil!” Bwahahahahahaha! Over at my other place, a reader had written in asking some really good questions. Since I had just posted on Pombo, this largely serves as a follow up to that previous post. Imagine Theodore Roosevelt Island filled with strip malls and hundreds of luxury townhouses, all with breathtaking views of the Potomac River and the monuments. A new bridge would connect the newly developed island with George Washington Memorial Parkway. That vision of the island’s future is contained in a House Resources Committee “brainstorming” document that was inadvertently released to the public. The committee’s chairman, Rep. Richard Pombo (R-Calif.) is looking for ways to raise $2.4 billion in new federal revenue. This is reminiscent of another Pombo story from 2004. After marching Saturday, yesterday I went down to the Mall again to check out the prowar rally, which was organized by the same folks who brought you the “You Don’t Speak for Me, Cindy” caravan last month, including Move America Forward and Free Republic. Not surprisingly the rally was somewhat whiter and maler than Saturday’s antiwar march. Also, it was a lot smaller. The smallest estimate in the media for the number participating in the antiwar march was 100,000. The largest estimate for the prowar rally was 400, and I think that’s about right — as long as you’re counting all the observers, curious tourists, and antiwar protesters who were gathered around too. The speeches I heard included a mention of a letter of support for the rally from Senator Lieberman, a reference to participants in the antiwar march as “100,000 radicals” whose views don’t represent those of real Americans (that was from Senator Sessions, who was one of the speakers), and a call for the marchers to be shipped to Iran. I didn’t stay very long, and from StealthBadger’s report I apparently missed some excitement, though he’s pretty vague about it. YUKINS: In the $52 billion bill, the administration included a key exception for contracting up to $250,000. That exception means that there will be no competition and no transparency whatsover. Approximately 60 to 65 percent of all federal contracting actions are actually below $250,000. You’d be astounded at how many small actions the federal government undertakes. SIMON: And for what kind of jobs are these? requirements so that you always stay below a certain threshold — in this case, below $250,000. SIMON: So somebody, for example, like a trash removal firm could do a whole series of jobs for $240,000 and never have to go through a competitive bidding process. SIMON: But on the other hand, a lot of companies have to move quickly. YUKINS: They do, and in fairness it is necessary to abbreviate the competition in a situation like this, but you really shouldn’t abandon competition and transparency entirely. No accountability and no transparency for almost two thirds of the spending. Josh Marshall is right. It’s been fun for left-wing sites to beat up on the few Republicans who voted against rebuilding funds, but pretty soon I think Democrats who voted for the bill are going to be regretting it as much as they now regret voting for the Iraq war. Bush has put Karl Rove in charge of managing the reconstruction. The money is going to go to contractors who are connected to the administration. Bush promises that there will be appropriate oversight, but Billmon has the history of how well Bush’s watchdogs have worked earlier. It’s on track to be the biggest-ever Republican slush fund. The one thing we can be sure of is that in 2006 Republican candidates will be hitting the jackpot on campaign contributions, as all the contractors kick back a fraction of the vast amounts of taxpayer money that went into their pockets. Conservative strategists are drafting a letter to Democratic members of the Senate Judiciary Committee demanding the release of hundreds of internal memos detailing contacts between the lawmakers and liberal interest groups opposing John Roberts’s nomination to the Supreme Court. By planning to press Democrats on the sensitive subject, conservatives seem to be pulling a page from the Democrats’ own political playbook. In the weeks leading up to the confirmation hearings, Senate Democrats have repeatedly called on the White House to give them memos Roberts penned while he was deputy solicitor general in President George H.W. Bush’s administration. This sounds halfway reasonable, until you think about it for a few seconds. It’s typical Republican strategy: throw dust in the public’s eyes and hope they won’t notice it’s irrelevant. Unfortunately, the Hill puts forth only the Republican side, mentioning one Democratic source who declined to comment and then quoting three separate conservatives who favored the Republican ploy. The reason the Democrats want memos written by Roberts is because they’re being asked to determine whether he’s fit for a lifetime appointment to the highest judicial position in the nation. Since the memos are examples of his legal work and indicators of his skill, personality, and philosophy, they are relevant to that determination. The reason the Republicans are asking for the Democratic memos is because they’re hoping to find something in them that will embarrass the Democrats. The memos were not written by Roberts and are clearly irrelevant to whether he should be confirmed. They are in no way equivalent to Roberts’s memos, but they would be equivalent to any memos related to communication between Republicans and conservative groups (say, Focus on the Family or Americans for Tax Reform). I’m taking a wild guess that the Republicans aren’t offering to release any of those memos. The Liberal Avenger alerts us to the latest thing keeping vigilant right-wing bloggers awake at night. It seems that the proposed memorial for Flight 93 in Pennsylvania has been infected with Islamic symbolism — specifically, a crescent (well, actually it’s an arc, but these geometric figures all look the same). Buck Batard at Bad Attitudes takes the next step, revealing that South Carolina is actually a secret Islamofascist stronghold. Now remember we’re not talking about an actual crescent (which itself is a simple enough shape that it occurs in lots of contexts). The objection is to something that looks like a crescent. What else looks like a crescent? Consider the alphabet. That’s right, from now on all true Amerikan Konservatives must avoid the third letter! You’ve probably heard about the “You Don’t Speak for Me, Cindy” caravan sponsored by Move America Forward, the fake grassroots “nonpartisan” pro-war group run by Republican PR firm Russo Marsh and Rogers. (MAF also worked with the Pentagon’s Office of Media Outreach on the “Truth Tour” that sent right-wing radio hosts to Iraq.) Not surprisingly, the group heading to Crawford to confront Cindy Sheehan and her camp contains some yahoos that don’t play well in the media, so there’s some effort to keep those people under wraps. But some of the more unhinged members don’t want to maintain the mask of civility, and one Ken Robinson refused to back down when confronted about his sign by Kristinn Taylor of FreeRepublic.com. (You know things are out of control when the freepers are the ones enforcing civility.) When the disagreement became physical, Robinson was arrested. Another faction of the pro-war demonstration, the Protest Warriors, specialize in parodying left-wing signs. Unfortunately for them, right-wingers aren’t known for appreciating subtle humor, and other protesters misunderstood which side they were on when they held up a sign reading “Say No to War!” with “unless a Democrat is president” in smaller type. Police had to be called in to rescue the Protest Warriors from their confused brethren. TBogg has the story. DCDL is a blog by Washington, DC-area members of Drinking Liberally. Opinions expressed are the writers’, not those of Drinking Liberally, which provides no funding or other support for this blog. See information on the revived DC chapter (2012).